This is the advice documentarian, Claudio von Planta offers the as yet seasoned film makers who come to him. Most people will recognize von Planta’s work from the 2004 Long Way Round and its 2007 follow-up Long Way Down. Von Planta was chosen to follow film actors and buddies Ewan McGregor and Charley Boorman motorbike to remote regions of the world. Von Planta possessed the rare combination of not only being a cameraman, but a documentary film maker, film editor, and military trained. All this, and Claudio could film while riding a motorbike of his own! The result was two epic journeys that continue to entertain and educate new audiences every day. The chemistry was obvious between the three men who often times were alone and roughing it in some incredibly isolated corners of the Ukraine, Kazakhstan and Mongolia. Claudio von Planta was a major reason why these films have stood the test of time. His was the first interview I conducted via Skype. Needless to say I was a wee bit nervous! But, there was absolutely no reason to be. When I began my conversation with von Planta, I already felt like I was talking to an old friend. Markus urged Claudio to take antibiotics as prevention against infection. Luckily, the men had unexpected down time in Ulaanbaatar for a few days, and von Planta had some time to recover. He continued to suffer from rib pain for close to a month, but fortunately the roads across the border into Siberia had good tarmac. The riding during the next 10 days was smooth and easy, which helped with Claudio’s recovery. At school Markus once advised Claudio to study medicine, but Claudio made a different choice. Growing up in beautiful Switzerland, he settled into a political science major at the University of Zurich. This may seem like the height of risk taking, but von Planta had something few other film makers had, officer training with the mountain grenadiers in the Swiss Army. This training served Claudio well. There certainly were a lot of dangerous events happening; the Soviet–Afghan War, the rise of insurgent groups such as the Mujahedeen and guerrilla warfare in the rural countryside. The one unexpected and unsettling event for von Planta was culture shock. In 1990 von Planta moved to London and began to gain a reputation by word of mouth. This is how he became part of one of his biggest productions to date; The Long Way series. Ewan and Charley had interviewed numerous directors of photography for the position, but their way of working was far too complicated, according to von Planta. Working on Long Way Round opened another important door for von Planta. Seeing how the motorbike adventure component of the series was so well received, Claudio realized a way to express his journalistic passion and make a film about an issue very close to his heart. You may remember Billy from a previous interview I did. It’s hard to forget Billy! As a seasoned travel guide to such places as Africa, South America and Australia, he invited Claudio to tour Peru in 2016. 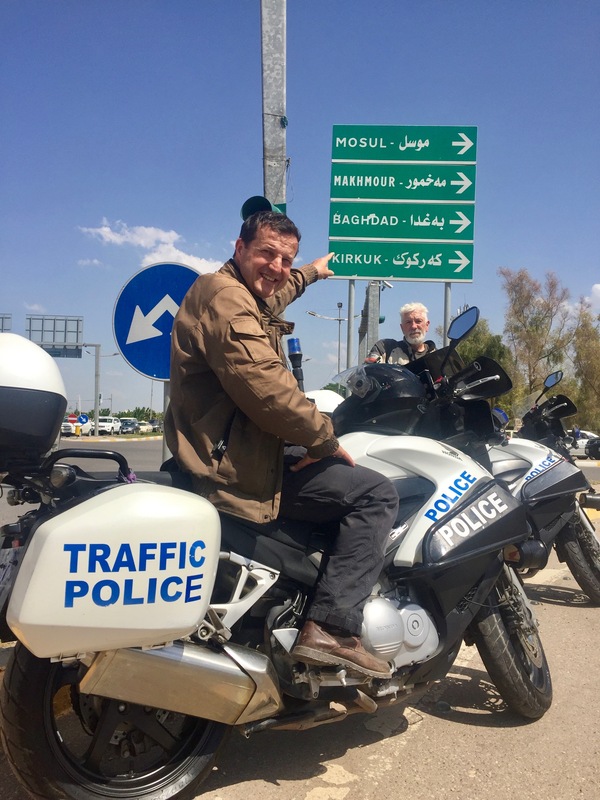 Feeling a kinship with Billy, Claudio suggested the possibility of organizing professional motorbike tours in little known corners of the world like the Kurdistan part of Iraq. Von Planta explained that at first Ward questioned his new friend’s sanity! Visions of ISIS and other terrorist atrocities were at the forefront of Ward’s mind. Von Planta was quick to assure Ward that traveling among the Kurds was very safe. Given that Claudio had 20 years of experience working in that region, he knew firsthand what a kind and welcoming people the Kurds were. Ward was eventually sold on the idea of organizing an exploratory motorbike trip with Claudio shooting a Long Way Round style documentary. Just as Ewan and Charley before them, Claudio and Billy set out for an unforgettable road adventure. It was not all fun and games, of course. Billy and Claudio visited the ISIS frontline near Mosul, met many refugees and also looked at a memorial in Halabja commemorating Saddam Hussein’s gassing of over 5000 Kurds in 1988. The oppression against the Kurds started 100 years ago after WW1, when the Kurdish population of 30-40 million people became divided among Turkey, Iran, Iraq and Syria. Ever since that time the Kurds have been caught in a territorial and religious war zone. Fortunately, there were also many moments of joy in Billy and Claudio’s A Kurdish Movie, as Ward charms the Kurdish people with his unique sense of humor and the Kurds sharing their thoughts, food and hearts with the two travelers. Which brings me to the link! But, I guarantee if you visit Vimeo and download A Kurdish Movie it is YOU, who will be inspired! I asked von Planta if he had any trips planned in the near future. And now I’m thinking; why the hell not?! Thanks to Billy Biketruck Ward for connecting me with Claudio. And much gratitude to Claudio von Planta for sharing his time and experiences! Bree @mermaidofblue Donavan rocked this article, beautiful job. @vonplanta you are the real deal sir. @Biketruck & @charleyboorman you’re energy blasts through Claudio’s photos. Posted in Interviews and tagged A Kurdish Movie, Billy (Biketruck) Ward, Charley Boorman, Cinematography, Claudio Von Planta, Ewan McGregor, Long Way Down, Long Way Round.